it makes our already pretty difficult to get to post office pretty isolated, to me. You can't really eliminate people needing to turn left from Highland at the Splat instead of proceeding onto Holland. And if they come up Day where can they go. Right now only right, so then what. And didn't that nice new grocery mart just go in at the social security building across from Diva? Maybe it would work and maybe I just hate and fear change, but I would not love this alteration. Hmm... It does make it harder to get a car back behind the post office without Chester st, but I think it would make it easier to get back there on foot. I've tried to make walkability a priority over drivability. Perhaps Bowers or Russell could be flipped to Southbound to compensate, or they could add a cut through through the Dover St lot? A left from Highland to Dover would be allowed. 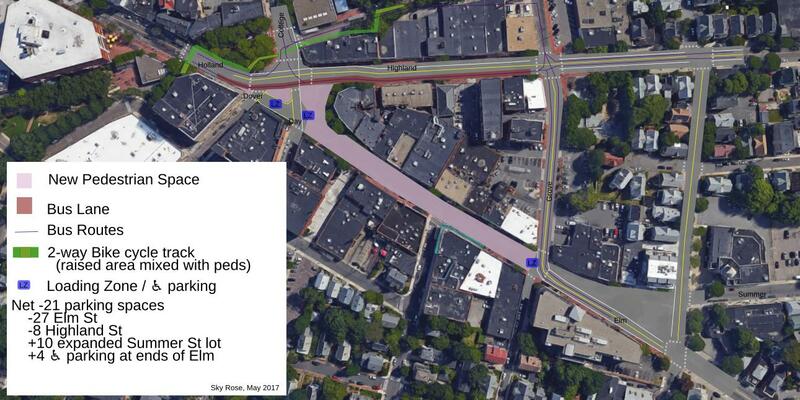 Think of it like a normal 4-way where the 2 lanes of Dover/Day just have a really big median. From Day you could go left/straight/right, too. There might be room to squeeze in some waiting space so the left turn Highland->Dover doesn't block other westbound traffic. I didn't know about the new grocery mart. Parking nearby is definitely important for that. There will be expanded parking at the end of Summer St 300ft away (comparable to the far side of the Star Market lot). With Chester now a dead end, there may be opportunity for parking there, if there's a reasonable way to turn around. I haven't been but I bet that in a location like this they're depending more on walking/biking than the average grocery store. Thanks for your feedback. These are exactly the kinds of concerns I want to hear. Where is there supposed to be parking on Summer? I think I missed that. I would argue that any time I'm going to the PO, it's for either dropping off something bulky I can't drop off in the mailbox at my office, or picking up priority mailers. Personally I already hate that our PO is both close to the main square but on a one-way so it's quite tiresome to get to, but, I don't drive by any more on my regular route to work. Also, Fresh Mart (finally remembered its name) location would make it very difficult for its delivery vehicles, which at the Porter Square Star are always jamming up Davenport St behind it. they have to deliver the food somewhere. I have always loved finding walk-only areas when I have traveled, so I imagine this would be popular -- the logistics of moving the street directions would need to be carefully considered. I guess I didn't draw that parking lot very clearly, sorry. The end of Summer St, where it connects to Grove St, will be turned into parking, approximately doubling the number of spaces in the small triangle. This is because all cars that would have used that small road can go Highland->Cutter->Summer now, instead of Elm->Summer. It would still be possible to get to the Post office. From the intersection, it's about 700 feet longer to drive down Dover->Orchard->Day instead of Elm->Chester->Herbert. (1700' vs 1000', measured quickly on google maps). Chester St will definitely be tricky. Lots of people have been concerned about it. There's lots of options to explore, from having a turnaround/loading zone that intrudes on the pedestrian space a bit, or pushing deliveries to off peak hours, or paving over the whole street with brick and sharing car/ped space there to gain the width of the sidewalks. I'm here to nitpick and chew gum and I am all out of gum. First, a nitpick! There is no "Highland St" in Somerville. There's a Highland Road over behind Lexington Park and Highland Ave runs up to Davis. To the actual proposal: The first block of Chester is unmarked but it looks like it would become functionally unreachable for cars unless it becomes two-way for that block; you didn't include the parking spots there in your tally. There's a cab stand in what would become the pedestrian area - would that relocate or just be eliminated? And how will it change things for the restaurants and bars if you're preventing cabs from dropping off or picking up patrons at their door? Having no loading zones in the path and no way to drive trucks closer to the various retail and restaurant establishments during the day than the loading zones may create some unintended consequences there, like trucks blocking that last block of Chester St if it's 2 way for that last block or delivery folks parking on Herbert and rolling more hand trucks through the pedestrian plaza between Starbucks and Chipotle. I think it's possible you'd actually reduce the amount of 'forced' pedestrian traffic that would normally walk by and patronize a lot of those places on elm since the bus stops - and the related commuter traffic - would moved off Elm. And, as noted in the previous comment, what happens to Day St traffic? Also, waitasec - are you making Highland 2-way for that last two blocks from Cutter to Davis? If not, what's the path for traffic coming down College Ave or Holland St that would currently end up going down Elm to Cutter? That's a whole lot of traffic to reroute. Yeah, I still haven't figured out what the best use of the Chester St space is. PRU pointed out that that's probably important space for bfresh. The count isn't supposed to be precise anyway. It's just saying "some parking will disappear but not as much as you think." I've never used the cab stand, so I hadn't thought about that. I think there's another one on Day St though, so that might be able to pick up some of the capacity. Walking end-to-end won't be a problem when the street is designed for walking. There's still a lot to figure out with deliveries. Stores might face pressure to adjust their delivery times (a good thing, since that'd mean less impact on the area). Maybe Chester St could be designed to have trucks back in for deliveries. Why is parking on Herbert and using hand trucks a bad thing though? Seems like a hand cart is way less disruptive than a large truck. Day St is 1-way northbound. You could turn left to Holland, straight to College, or right to Highland. Highland is 2-way everywhere. The yellow/white lines are meant to show that, but I guess that's not entirely clear. Whether bus riders will see the space is a good thing to look at, but I think it will be okay. All 6 buses will stop on Highland eastbound and the T stop westbound, and the 2 that go down Elm will also stop at Elm/Grove. Currently, the asymmetrical setup means that you might see Elm St on one leg for some routes, but the other direction might be far away so the proximity isn't as useful as it looks. I think the faster bus travel and better connections will cause more foot traffic to the area. Here's an attempt to connect the Somerville Community Path across the gap. My goals were to keep bikes / runners / through traffic from disturbing the pedestrian environment (i.e. minimal mixing with peds) and to keep the path off of the streets so kids and families can use it safely. It's not particularly important to the redesign, but while I'm redesigning the square anyway, I thought it'd be nice. It takes a small amount of space away from pedestrians in exchange for causing fewer bikes to try to worm their way through pedestrian spaces. Losing some space in the plaza is less of an issue when all of Elm St is plaza space. Going west, it starts on the sidewalk north of the busway, then crosses to the south side of the small lot behind the bank. It crosses College next to (but not in) the ped xing. It goes through the plaza in a way that leaves an island for peds waiting to cross Holland/College, then goes along the plaza in a protected 2-way lane, probably with some space taken out of the plaza. It crosses Holland next to, but not with, the slower pedestrian xing. Places where it mixes with slow pedestrian traffic (the Holland/College plaza and by the west T stop) it'd raise up to remind bikers that they're in a pedestrian environment. What would be the plan for Somervilles disabled residents? I imagine this would be a nightmare for them. It would also flood the busy traffic that normally runs down elm into other already congested areas. It would make traffic that much more of an issue not to mention even more limited parking options in the area. This along with other concerns previously pointed out just shouts awful idea! No offense, truly. There are just so many negatives to this. I would not be in favor. There just isn't a need for this type of thing. There's enough space for 2 or 3 accessible parking spots at each end, and potentially access via Chester St from the south. (Still figuring that one out). The space will remain drivable for deliveries, so it may be possible to drive through to accessible parking in the middle. Assuming close enough parking is possible, I think that having a place removed from traffic will make it much safer and easier for disabled people to use the space. There would be a decrease in parking, but spaces for pedestrians are more important than spaces for cars, and increased foot+bus traffic to the area would balance that out. Basically all the traffic that goes down Elm now would be moved to Highland, not neighborhood streets. Orchard St is too far out of the way and Winslow Ave is inaccessible from this direction. It's 2 lanes -> 1 in both directions, plus a bus lane, plus a lot more pedestrian traffic. A smaller simpler intersection will probably mean a quicker light cycle, too, so less delay. And it's important to look at people moving through the square, not vehicles, so with the bus+ped improvements, I think it will be close. Certainly worth doing real traffic studies on. And even if car traffic does get more congested, it would still be worth it. Increased safety and a better environment for pedestrians should have higher priority than cars. These are all really good concerns (especially accessibility) and it's important they get addressed, but they don't make this unsolvable. 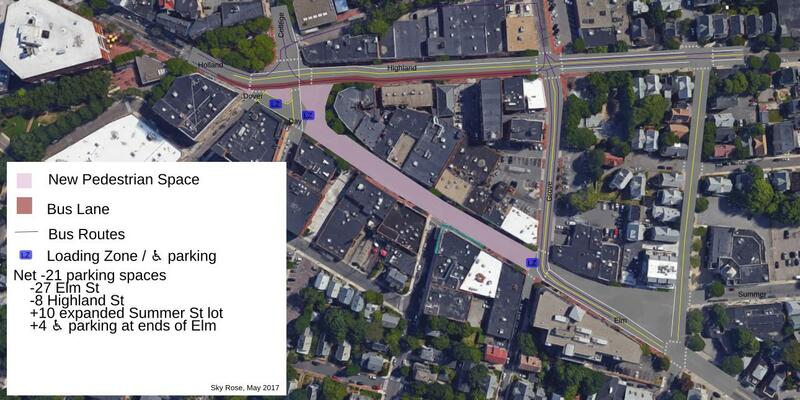 As for the "need for this type of thing": I want Elm St to be a place I feel comfortable and safe as a pedestrian. I'd love to sip a coffee from Diesel on a bench outside, or wander slowly down the street choosing a place to get dinner. These are things that can't happen on a street with heavy traffic and 8 foot sidewalks. agreed with you. I love pedestrian areas but this area is a cluster every day already. it won't get better for shunting the same amount of traffic onto narrower streets. see also, downtown crossing. Holland and Elm eastbound are 2 lanes, right? So then Holland eastbound goes from 2 lanes to 1 lane eastbound on Highland. Similarly, Highland westbound is 2 lanes, so then it bottlenecks to 1 lane? Chester and Bowers become dead ends, which makes for a weird parking situation: you're then assuming drivers have the skill to back up properly and/or turn around. I might advocate for eliminating parking there and adding more bike racks. Adding spots to Summer St lot is ... interesting. Before we moved to Davis Sq, we found the lack of parking to be pretty hostile to drive-to-Davis restaurant-going. But if restaurants are at capacity with locals, then I'd say that's low priority - but if the situation is more complicated than that (4 locals and their 2 friends from Arlington), then hmm. Then again, car density rises to match parking capacity, soooo I think overall this can be ignored. Having a clear way for bicycles to go from east to west would be lovely, especially if they didn't have to dismount when around pedestrians. Sadly, I don't think that's possible: if you go anywhere near the T exits, one really should dismount (or have excellent balance at moving 2mph). None of this is meant to discourage the idea. I find pedestrian-only spaces to be wonderful, and I would love if Davis Sq were modified to have one. The plan with this is to make the second eastbound lane a bus lane, potentially shared with bikes. There are 6 bus routes going through Davis, so if the goal is to move as many people as possible and encourage greener/denser transportation, that's better than a second car lane. Car traffic is 1 lane everywhere (except maybe turn lanes), so there's no place where there's a sudden 2->1 bottleneck. Yeah.... there are lots of options for Chester St, none of which sound perfect. I think my favorite so far is parking, including handicap accessible parking, with a cul-de-sac that intrudes slightly into the pedestrian area. This would also be a potential loading zone. Bowers Ave would not be blocked, since it has access to Grove and the open part of Elm. Though it may be nice to reverse it for better access to the neighborhood back there. I generally agree on parking, but I think parking on Summer St would be better than usual: It's off street and close but not in the way. That space wouldn't be that nice for pedestrians anyway since it's so wide there. It should be market-rate parking though. I'm worried about bikes, too, since my most of my time in Davis is spent biking through. I posted a comment with a proposal for connecting the Somerville Community Path. And for bikes going in other directions, biking in traffic is less scary in a slower smaller intersection. I'm also hoping for bike lanes on Elm St (as part of a different project), a Hubway station at the east end of the pedestrian area (for better access to/from everything south and east), and bike parking throughout. I've considered bike lanes through the pedestrian area but I think that it'd disrupt the safe pedestrian feel and also would have a weird connection at Day St.
Hmm. Busses can't really share with bikes -- that's basically the worst case, being stuck in a lane with busses, especially if they make stops. Very stop and go with a large vehicle who can't see you = sad times. If you've got busses going east on Highland and turning left Grove to get to the T station, you're going to need a light at Highland and Grove. That's only going to make the traffic on Highland uglier, with three lights tightly spaced. The Cutter & Highland intersection also changes a lot and needs a left turn cycle from Cutter to Highland if Highland stops becoming one-way at that point. Cutter (and/or Willow and/or Hancock) would need to become two-way or reverse directions to carry traffic that'd otherwise take Elm out of Davis down to Elm and Summer. Loss of traffic for businesses is potentially bad for not just the block of Elm that becomes pedestrian-only, but the next couple of blocks of Elm and Summer. Moving busses from Elm to Highland eliminates the bus stop on Elm that's all but on the doorstep of the new grocery store (bfresh) there, which is probably unkind to their customers. Six bus routes go by there currently; not all of them would go past a stop on Elm past Grove. Similarly, having the pubs (and restaurants serving alcohol) on Elm not being able to call taxis to their doorsteps an unpleasant adjustment at best. It's hard to be a responsible drinking establishment and see your tipsy patrons to their rides when you can't see their rides from the door. Deliveries that need to park half a block away and move things by hand truck are a lot slower than deliveries that can park right outside the door. Traffic in Davis is not all going to or from Davis. Ugly and slow as that intersection is, those are major roads carrying through traffic. Shoving that traffic onto Broadway or Mass Ave is not a feature. Powderhouse circle is already backed up at rush hour. Yes, it definitely needs traffic studies. I'm not a professional. Asymmetrical buses are less useful than they look. For the through routes, you can take the bus in one direction but not the other. For the terminal routes, going down Elm adds multiple turns and minutes to the route. And a short walk to Highland or Elm/Grove is not really an issue when you're walking through a pedestrian friendly environment instead of crossing a busy street. For the pubs, walking to the loading zones at the ends (and maybe at Chester) will be very safe, even for drunk people. I hadn't thought about the responsibility to the pub to see them get there though. That's a good point. MBTA would definitely be involved in this. I hope they'd find it positive with better turnarounds and a bus lane, but there's some stuff about turning radiuses and signal priority and, for the community path, use of the space near the T station, that they'd need to participate in. As for local businesses and input, I'm imagining a formal feedback process like Inman Square and Sullivan Square are doing right now. All the busroutes using the busway would still be asymmetric. It'd be a smaller loop for the ones turning around to get to the busway, but it'd still have a left turn, and it'd be a left turn off of a busy two-way street instead of a left turn from a one-way to a one-way. The 88 route would jog less, but the 87 route would jog instead. You'd have busses turning both left and right from Highland and Grove -- that split alone makes me dubious of the practical value of a bus lane there. The busses going left from the bus lane can get across the traffic lane with the left turn cycle (or not -- do cars still get to use that bit of Grove to get to the parking lot? Should those busses be merging into the car lane? ); the busses going right have left-turning busses keeping them from reliably turning right-on-red, and I'd like to know if their turn radius means they'll need to use some of the car lane to make that turn. If Highland there is two-way, people coming out of the drugstore parking lot may also try to to turn left onto it, further complicating traffic. That could be discouraged with signs, but without use of Elm, how do those folks then get turned around to go east on Highland? And a short walk to Highland or Elm/Grove is not really an issue when you're walking through a pedestrian friendly environment instead of crossing a busy street. The grocery store is on the same side of the street as the bus stop on Elm. If you're an unladen, able-bodied pedestrian, a block or so is not much bother. If you have a load of groceries and/or are not so able-bodied, it might be an issue. (And you do have to cross the newly-complicated Elm/Grove intersection to get to one of those possible stops; a Highland might not be so bad.) One thing I'd very much like to hear from the businesses in the area is how much traffic they see from folks dropped off and picked up at their front doors. Good points about Highland and Grove. Here are some quick thoughts about potential solutions, but a traffic engineer would definitely be necessary to figure this one out. * Pulling the eastbound car stop bar back a bit and giving the buses a green a few seconds before cars would probably make that left (and right, if they need extra space for a wide right turn) easier. * For coming out of the lot, making a left as the northbound traffic gets a green would be about as difficult as making a left at a normal 4-way light. The westbound highland stop bar would need to be pulled back. * Going west from RiteAid could also be done by going south on Grove. * There's enough curb/parking nearby to play with turn lanes / receiving lanes. I hadn't considered pulling the westbound stop bar back. That could make the left turn out of the lot workable, with some warning to folks turning right from Grove. Cars can find their way around, but without delivery truck access, our new grocery store isn't going to last long. While a big new pedestrian plaza would be awesome, I'm not sure if this is really an intersection where you can be cavalier about "I don't care about cars." It's kind of hard to get to a whole corner of Somerville without going through it, and Highland Ave already slow carrying three lanes of cars westbound there. Reducing to one seems likely to be a real problem, especially if you also have to slow down the lights at Cutter and add one at Grove. It could be worse than College. Where does that traffic get displaced to? I'd need to hear from a traffic engineer, I think. It would certainly affect Broadway and Powderhouse and Orchard and probably Morrison and Cameron and Russell and Mass Ave. While I like the idea in theory, I think it would make bfresh's life so miserable that they would have to close. And I'd like to keep them in business. I'm interested in reading more about that history, and wasn't able to find more information based on what you said. Do you know of good resources to use, or good keywords to search for? There was never a full account in any print outlet, though I do recall a brief notice in the Globe or Somerville Journal. I believe the consultant was named Veigh, first name possibly Bob. He came from a contract with Tufts for Chinatown planning around Tufts' Boston holdings. His contract with the City was a sole sourced negotiated contract, for which the required OMB documentation was not in the City's file prior to the time the citizen complaint was received by HUD. When, predictably in those days, the required materials were introduced and back-dated, the falsification of the record became the grounds for voiding the contract. None of this appeared in the press. I walk down that stretch of Elm twice a day unless I take the bike path instead, and it's very crowded at 5:30, with commuters and slower walkers and people standing around talking and people standing around smoking . . . I would definitely like more sidewalk/plaza to walk through. I'm also in favor of simplifying the Davis Square intersection. - Bfresh deliveries seem like a problem. - Loss of Bfresh bus access is also a problem. I'm young and able-bodied and capable of walking with groceries; lots of people aren't. - I don't have experience with the late-night taxi scene, but it sounds like pickups in the existing mode would be challenging. - There are currently a lot of cars on both Highland and Elm at busy times of day. It's all very well to say that people won't drive if driveability is worse, but I think that the fact that people drive in Boston/Cambridge/Somerville *at all* shows that this only goes so far. - It's already pretty challenging to drive north/south in the Davis area and a bit to the east; forcing more east/west traffic onto north/south roads, even for just a little bit, isn't going to help that. - I've been told that pedestrian-only areas become less safe during off hours because there's less traffic in general and they become very isolated. If this is actually the case, that should be addressed. - I was just in Rotterdam (Netherlands), which has some excellent examples of how to have adjacent-but-separate space for bicycles and pedestrians. Minneapolis has some nice shared/separate bike paths, too. - Someone raised concern about loss of traffic affecting businesses further down Summer St, but by my count, the VFW and the veterinarian are the only significant non-residential establishments east of Cutter. I do wonder about access to that parking lot, though. - Deliveries to bfresh and other places could happen late at night or early in the morning. Large delivery trucks are probably the most disruptive kind of traffic, so it makes sense to push them to off peak hours rather than trying to accommodate them through the pedestrian space. Having that traffic there at night also addresses the area feeling desolate at night. - Bfresh already doesn't have quite as good bus access as it seems. If you live north of the square and take the 96 to bfresh, on your trip home you still have to go to the T station on your way home. This would let the 96 and 87 stop at Elm+Grove, (200ft away, much closer than the T station), in both directions. I am thinking about less extreme options. - I don't think time-based closures would work, since you still need eastbound traffic to go on Highland, so that doesn't make anything simpler. - Perhaps (in order from north to south) buslane+floating bus stops+car lane+parking/loading+2-way bikes might work. It doesn't get sidewalk space, but does make the street feel safer. A lot of the benefit of the extreme version is that the splat becomes way smaller. Like, half as big. And that makes it simpler, slower, and safer. Trying to maintain easy access to Elm for cars+buses all day means that the splat has to stay as a big expanse of pavement.